This four-camera kit provides comprehensive coverage for your home or small business. Wi-Fi security cameras are a simple solution for apartment dwellers and anyone else who wants to keep an eye on a small space. But if you have multiple rooms or a large property to watch, a wired DVR-based system might be a better and more economical choice. The Wisenet All-in-one HD DVR Security System is a great solution for single-family homes and small businesses—as long as you don’t mind dealing with wires. I tested the model SDH-B84045BF, a four-camera bundle that includes an eight-channel, 1TB DVR. 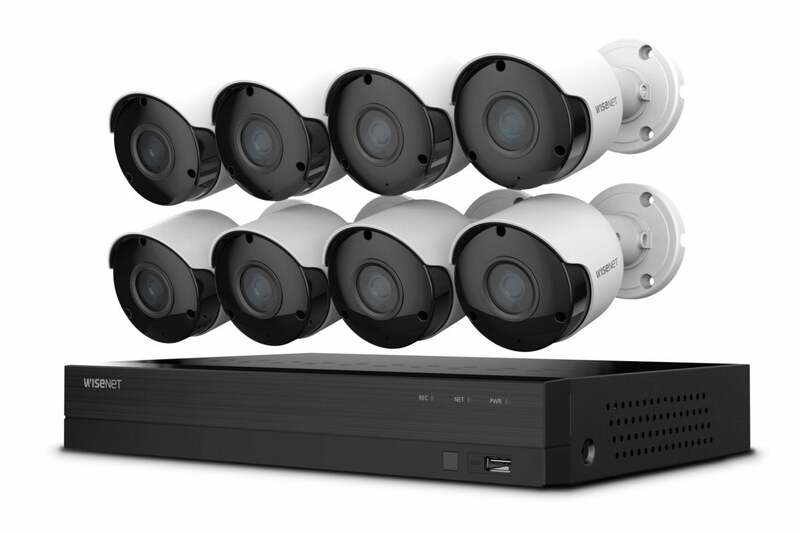 (Hanwha Techwin also offers an eight-camera bundle with a 2TB DVR, and a 10-camera kit that includes a 16-channel, 2TB DVR). The same bullet-style camera comes in all three kits. It offers a 104-degree field of view and is equipped with a 5MP image sensor that delivers resolution of 2592x1944 pixels. The manufacturer says that resolution results in images that are 2.5-times more clear than competing cameras that deliver resolution of 1920x1080 pixels. The benefit: more-detailed images for forensic evidence. The weatherproof cameras can be mounted indoors or out, since they’re rated IP66. That means they’re completely protected from dust ingress, and they can withstand high-pressure water jets from up to a 12.5 nozzle from any direction. 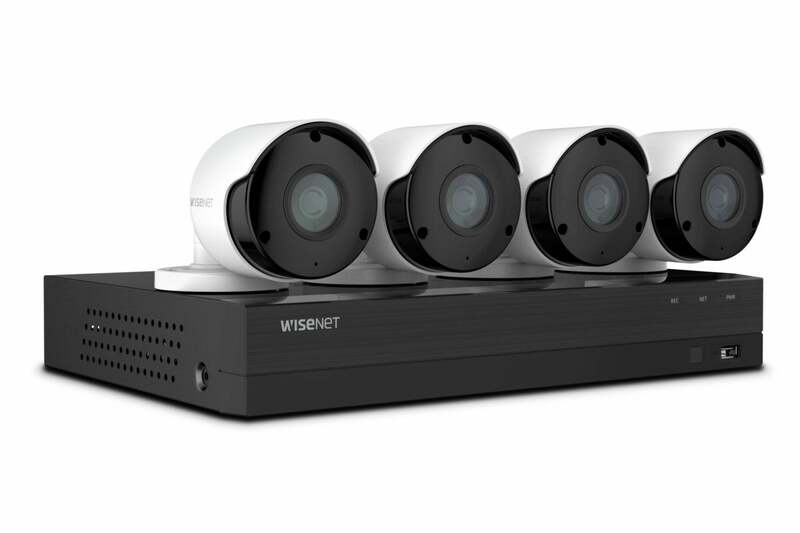 They can operate in ambient temperatures ranging from 32 degrees Fahrenheit to 104 degrees F.
The Wisenet All-in-one is available in four-, eight- and ten-camera kits. The DVR can record up to eight cameras simultaneously, and you can record two cameras to the cloud at once (provided you have the uplink bandwidth to handle it). You’ll need a subscription to Wisenet Life Cloud for the latter, and you can start with a free six-month trial that lets you store up to 1GB of video for 7 days from one camera. You’ll need to open your wallet if you want cloud storage after that. A Wisenet Cloud Basic plan gives you 10GB and 30 days of storage for $5 per month. The Advanced plan provides 50GB and 90 days of storage for $15 per month, while the Premier plan bumps it up to 100GB and 120 days of storage for $25 per month. All three plans also include the ability to create timelapse videos from your cloud-stored footage twice daily, compiling detected events into a digest so you don’t need to scrub through hours of footage to find what you’re looking for. You can also add Wisenet’s SimpliSearch service to any plan for an additional $7 per month. This AWS AI-powered service allows you find video footage using keyword searches. Setting up a multi-camera system like this is a good deal more work than putting up a typical Wi-Fi system, because each camera must be hardwired to the DVR. You’ll find most of what you need right in the box, including four 60-foot coils of cable, an ethernet cable to connect the DVR to your router, an AC adapter for the DVR (and a second one for the cameras, along with a four-way splitter), a mouse (for the DVR, not your computer), and a remote control (the only wireless component in the whole kit). You’ll need to supply an HDMI or VGA monitor and the cable needed to connect it to the DVR. Given the logistics of determining locations for the four cameras (each of which must be well within 60 feet of the DVR—be sure to leave some slack), mounting the cameras, drilling holes in walls to run the cables through, and making all your connections, you’d be wise to spend the better part of an afternoon just on planning and trial placement before you pick up a tool. The security system offers four different recording modes for each connected camera. Once the physical work is done, getting the system online is a relative breeze. A startup wizard appears on your monitor as soon as you power on the DVR, and it walks you through the particulars of obtaining an IP address, setting the date and time, and formatting the hard drive. At the completion, your four cameras will be displayed on a four-by-four grid. In addition to storing captured surveillance video, the DVR also provides the software interface for controlling the cameras and for viewing their live feeds. You can view all four feeds at once—which feels kind of like you’re spying from a shopping-mall security booth—or you can cycle through each one individually in full-screen mode. Each camera has its own toolbar beneath its feed, where you can manually record and play back video, take screenshots, and adjust the color settings. All input is done via the supplied mouse connected to the DVR. The cameras have exceptional video quality, with nice sharp detail and rich color that will come in handy if they’re ever needed to document a criminal act. Infrared LED night vision penetrates up to 82 feet in the pitch dark, and a whopping 130 feet with available ambient lighting. That’s enough to take away any intruder’s cover of darkness. The Wisenet companion app makes it easy to look in on your home and play back any event video when you’re away. A privacy-mask feature takes this idea even further by allowing you to block out up to four areas in the camera’s view. Again using the mouse, you drag and resize a bounding box for each area, which then appears as a black box in the camera feed, visually masking out the area and disabling motion detection there. Each camera’s motion detection can be enabled and adjusted from the DVR’s interface. Once you select a channel, you can change the detection sensitivity on a scale from 1 to 8. For more fine-tuned detection, you can set up to four motion zones by dragging the mouse across a grid over the image, defining the area you want to monitor for movement while masking out the area around it. 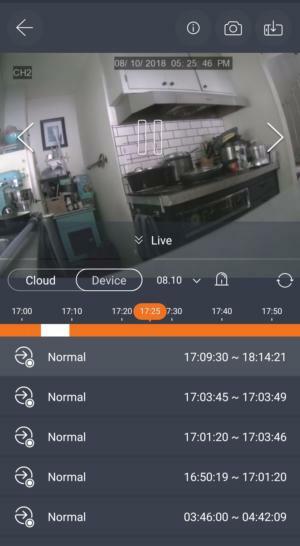 The Wisenet Life app gives you the same multi-camera control in a much more familiar experience. Once you download the app, you just scan the QR code on the DVR and enter your system login credentials. All your connected cameras will appear in a multi-view layout. As with the DVR interface, the app allows you to view all the cameras’ live feeds simultaneously, displayed in two- or four-channel grids, or each one individually. You can quickly toggle from multi-view to an individual feed by tapping the appropriate camera’s image. While you’re viewing an individual feed, the app displays controls for taking a screenshot or recording video directly to your mobile device. 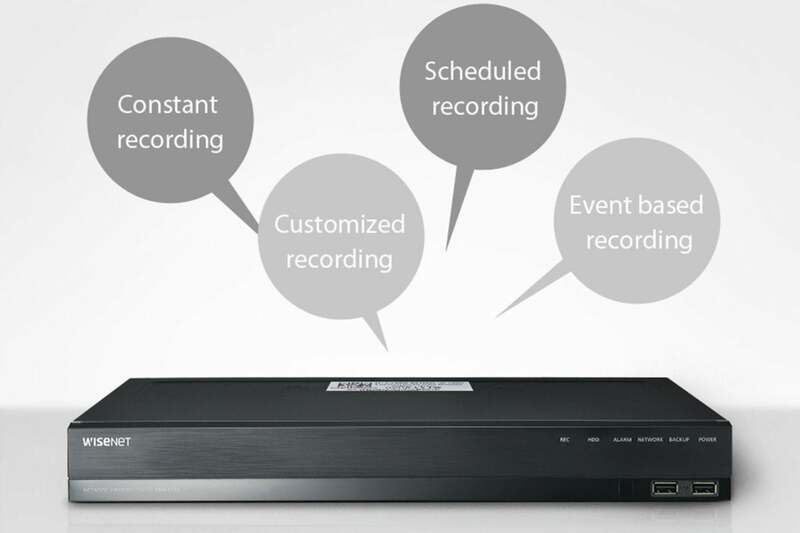 It also shows a log from which you can play back any detected event recorded to the DVR or to the cloud. The interface for reviewing events is pretty intuitive: Select either “cloud” or “device” to load its stored videos. You then set a date from the calendar, scroll though the timeline to a specific point in that day, and click the image to play the video back. If too many events are detected, as happened to me one day when the app logged more than 100—mostly of our house pets—you’ll get a pop-up message advising you to adjust the motion sensitivity and zones on the DVR to reduce the event frequency. You’ll probably be aware of the issue long before you get this message, however, because your phone will be blowing up with alerts. As mentioned above, you can only enable and disable motion detection on the DVR, but you can turn event notifications on and off in the app if you don’t want to be bothered while you’re out and about. Wisenet’s four-camera DVR kit is a solid, reliable system. Once you get over the creepy surveillance feeling, looking at a comprehensive view of your property on a big screen is pretty comforting. And the Wisenet Life app makes it easy to look in on things when you’re away, without having to hassle with a bunch of nested controls. This type of security camera system isn't for everyone. Just routing the wires will probably involve minor modifications to your home, which rules it out for most renters. And a four-camera system is overkill for the homeowner who just wants to keep an eye on their kids or pets while they're away (plus, there's no audio). But if you own a large home or operate a small business and can cope with the wires, this affordable and easy-to use system is well worth considering. The Wisenet All-in-one HD DVR Security System is a great DIY multi-camera system for comprehensive coverage of larger homes and businesses.